Creating a press release or a business article for your site can often leave you in a great need of a good-looking photo. When you don’t have much time to research possible options, it is hard to decide on something. Depositphotos, a photo agency from Florida offers a way out of those troublesome situations. Using LiveChat, Depositphotos’ clients can, within minutes, learn about the offering and find something fitting for their projects. Perfect customer satisfaction score is a goal every company should strive for. It sets you on the right track when it comes to what your company should be doing – create a product that will make all your customers satisfied. Even when your customers might have some problems, you should be there to handle them and make sure their experience is not tarnished. Often simple things can get in the way of achieving your goal. Even if you have an answer to a question, your customer might not be satisfied with the response time. There are also cases where the offered form of communication is not enough. Anna comments that implementing LiveChat on their site was a way to handle the inquiries of those who were reluctant to use the phone to contact the support. It also allowed for a faster way of communication between Depositphotos team and their clients. The choice between LiveChat and other providers came down to three areas: easy integration, ease of use and price. Depositphotos team found that in all of those areas LiveChat came before the competition. With a team of 5 operators shifting so there are always 2 people online, the chat function at depositphotos.com allows visitors to quickly get the information they need and choose the right product for their projects. Customer queueing – lets customers know that someone is on the other side and how long it would take to reach an agent. Chat transfers – allows operators to transfer chats to other operators; Very useful when the visitor asks for specific information: operators can transfer the chat to specialists in a particular field of your product to answer the questions. Additionally, it allows operators to shift without dropping any chats. Chat supervision – allows supervisors to see how operators are doing in their chats; This can be used to see how operators go through their chats and what fields can be improved or to help less experienced operators. Customer message sneak-peek – shows what the visitor is typing in; This feature allows operators to start formulating their answers before the visitor finishes typing, which significantly shortens the wait time for operators answer. Multiple language support – allows for different chat window languages; Useful when handling international customers, they can be addressed in their native language. By combining these features, Depositphotos managed to create a robust and successful customer support and online sales service. They receive more than 300 chats every week through LiveChat. Anna also mentions the positive response of clients to the new functionality on site. 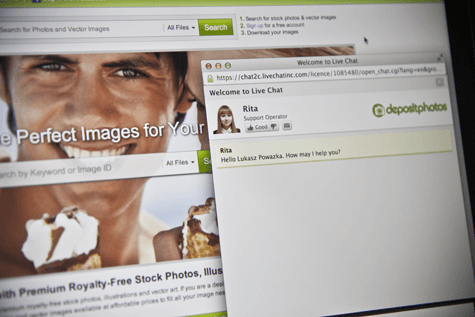 Implementing a LiveChat on their site seems like a correct step since they’ve been receiving hundred of enquiries from clients right from the very beginning of Depositphotos’ live chat. Doing business with many international clients, Depositphotos required a tool that would make multilingual support possible. Using LiveChat window in 4 different languages, they can talk in English, German, French and Russian with their customers. Taking into consideration that some visitors prefer chat communication to phone communication, having LiveChat on site helped generate a portion of completely new leads. Using LiveChat, Depositphotos team can make sure that all the applications are now answered. Depositphotos’ customers are very fond of the LiveChat functionality on Depositphotos’ site: “Our users are really satisfied with the opportunity to have their problems solved right here and right now.” It seems that short response times are very important for customers and being able to offer relevant information on the spot, without the need to resort to email or phone communication, is really what visitors need. “When a customer comes to our website, he/she evaluates it as compared to our competitors’. They want to know if our license agreement covers their particular use-case. Thanks to the real-time support, we’re enabled to make a customer realize Depositphotos’ benefits. A photo agency based in Florida. Since its founding in 2009, Depositphotos has been constantly expanding their photo and vector graphics base. A professional service for both buyers and contributors, Depositphotos offers high quality materials for domestic and international clients.